Who said the sites you add to SERPed.net must be yours? You are welcome to add the sites of your clients or even potential clients and provide them with detailed site reports. You will be able to include all the information generated by SERped.net: data from Ahrefs, Moz and Majestic SEO, uptime statistics, search engine rankings, a competition analysis, Web analytics and more. Imagine you want to sell your site... You could generate a report and give it to prospective buyers. Imagine you are bidding to win a contract... You could walk into a meeting with a killer document that will blow everyone away! These reports will allow you to charge your clients hundreds more per month. 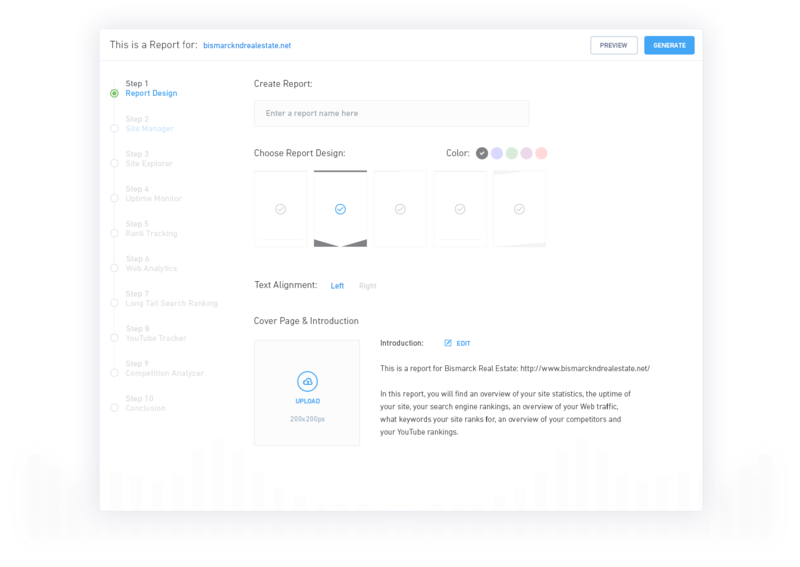 They will think you are spending hours putting these reports together for them, when in truth, you click a few buttons and the SERPed sytem, with its integration with all the tools, handles it all for you. Once you generate a report for the first time, filling in a bit of data and spending a few minutes on it, future reports can be generated in seconds as you can save reports as templates, so each month it comes time to send a new report to your clients, you click a few buttons, update a bit of text and hit 'generate'! You will be a rockstar in their eyes for the quality reporting you provide them with. PDF Site Reports is by far the biggest tool inside SERPed from a coding point of view. It takes thousands of lines of code and weeks of our team working full time to bring you such a robust and powerful tool, and now you can get the most out of it and use it to your advantage to recruit new clients, and blow existing ones out of the water with your professionalism. Site Reports really does encompass the power of SERPed, where each tool is connected and working for you. Once you have setup all the tools, as time passes the reports get more full of data and provide even more value. This function alone is worth 10 times the monthly membership of SERPed.